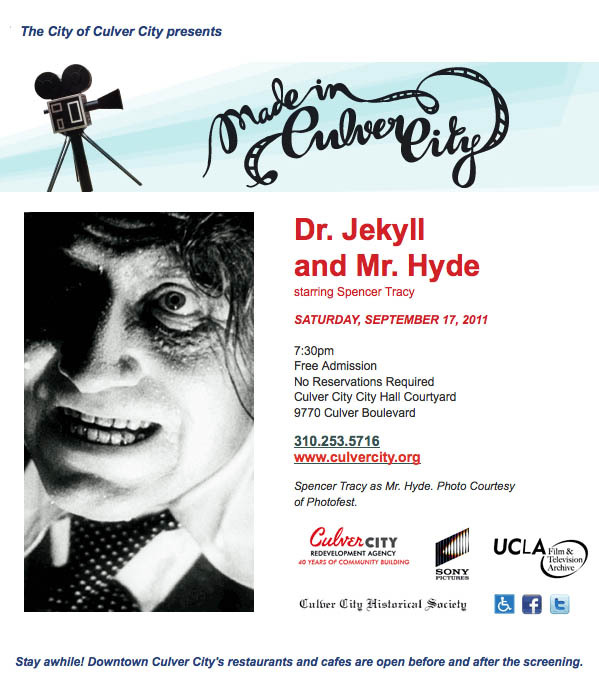 Made in Culver City, a free film program presented by the City of Culver City, will feature Dr. Jekyll and Mr. Hyde starring Spencer Tracy on September 17, 2011 at 7:30pm in Culver City’s City Hall Courtyard. Culver City City Hall is located at 9770 Culver Boulevard and parking and dining are available in Downtown Culver City. Dr. Jekyll and Mr. Hyde was directed by Victor Fleming and also stars Ingrid Bergman and Lana Turner. The film was based on Robert Louis Stevenson’s classic tale of a 19th century scientist’s investigation into the nature of good and evil. This 1941 film version of Dr. Jekyll and Mr. Hyde was set in London but filmed entirely in Culver City at Metro-Goldwyn-Mayer Studios. This year marks the 70th Anniversary of the film’s release and the 94th anniversary of the incorporation of the City of Culver City. Special permission for the screening has been provided by Warner Bros. Classics. 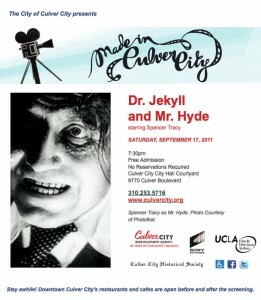 Made in Culver City celebrates the golden classics that were produced in “The Heart of Screenland”. The City of Culver City has a unique film legacy and has been the home to Thomas H. Ince Studios, Hal Roach Studios, DeMille Studios, Metro-Goldwyn-Mayer, Selznick International Studios, RKO Pictures, Pathe, Desilu and, currently, The Culver Studios and Sony Pictures Studios. Made in Culver City is sponsored by Sony Pictures Entertainment with participation by the UCLA Film & Television Archive and the Culver City Historical Society.